The organizing committee of the 2020 Tokyo Olympic and Paralympic Games unveiled sports pictograms for Tokyo 2020 to mark the 500-day countdown to the Games on Tuesday. The 50 sports pictograms are designed to present 33 sports that will feature in Tokyo 2020, with more than one pictogram for some sports. They will be presented in both "Free Type" and "Frame Type" for different uses including posters, tickets, maps and guidebooks. 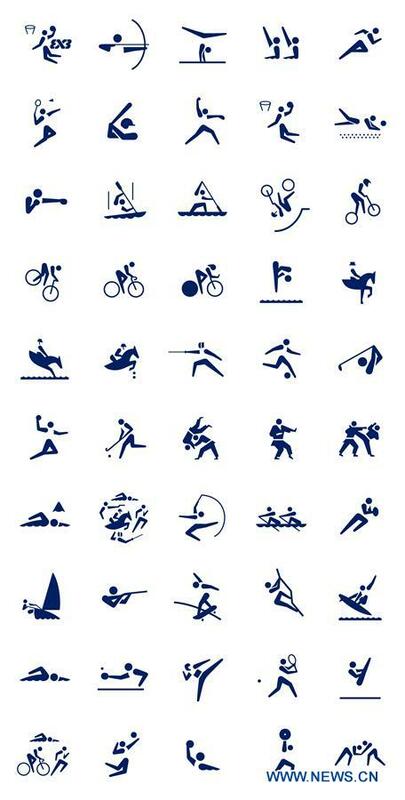 The first sets of Olympic Games sports pictograms were first introduced at the Tokyo 1964 Games and since then have been created for every edition of the Games. Masaaki Hiromura, leader of the pictogram designing team, explained that the designs are combination of the legacy from the 1964 Games and the current dynamism of the sports. "It is a real honor to have participated in the design of the Tokyo 2020 sports pictograms. I have tried to express the dynamic beauty of the athletes through these pictograms, while respecting the legacy bequeathed by the pioneers of the Japanese design industry in their designs for the Tokyo 1964 Games," the 64-year-old said. "I hope that these pictograms will inspire everyone and help generate excitement for the different sports at Tokyo 2020," he added. The Tokyo Olympic Games are scheduled to take place from July 24-August 9, 2020.